Website Insight – A guide to understanding Google Analytics for every small business. For Business Owners who want to take control of their website, make informed decisions and achieve online success. Website Insight – A guide to understanding Google Analytics for every small business. For Business Owners who want to take control of their website, make informed decisions and achieve online success. Data is everywhere in today’s world & identifying what is important to your business can be overwhelming. Many people solely rely on their website builders to monitor website activity & report back suggestions & improvements. Unfortunately a lot of these agencies also do not properly understand the reports & your business objectives. Without a clear understanding of what you want to achieve from your website & digital marketing efforts, this data tends to go to waste. Have you ever had website reports emailed to your inbox only to be ignored and eventually deleted? Do you want to get a better understanding of how your customers use your website & increase conversion rates? Would you like to control your own data & make informed decisions to meet your business goals? This book is designed to allow everyday small business owners to better understand their own website data & drive improvements. I believe that you, as a business owner should be able to interpret your own Google Analytics reports, without having to rely on a web builder or digital marketer telling you that “everything is going well,” once a month. Take control of your own data & see for yourself. I am not saying that you don’t need web & marketing teams, you do, but by understanding these reports you create a much more powerful digital strategy to meet your goals and business objectives. 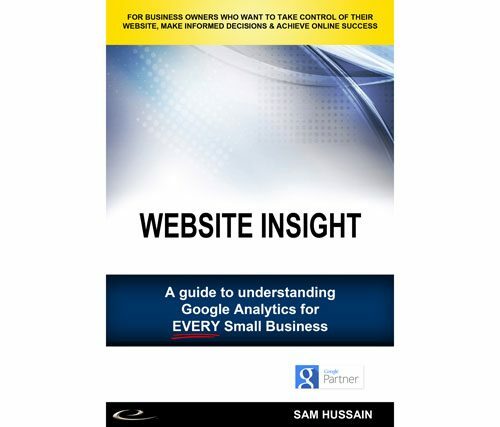 Google Analytics is a very powerful web analytics software platform that can do much more than I am going to explain in this book. I am going to breakdown the different sections of Google Analytics for you & help you understand the basic Google Analytics reports, so you can start to identify what is important to your business & your objectives & start to create a data driven actionable plan. This is not a technical how-to manual but more of an overview to show you what is available in Google Analytics and to help you get started. It is my hope that you find the information in this book useful, start to review your website data on a regular basis and truly start to drive your online success. The perfect introduction to Google Analytics as a tool, and web data as an influence in your business. Clear, concise, and useable knowledge that has enabled me to take my marketing and web design in a more confident and informed direction. Prior to reading this guide I had wasted hours fumbling my way through GA, now I know what I’m looking at, and can focus on understanding what it means. Would recommend to anyone that wants to understand their relationship with customers online, and find more meaning from their GA data.